Joy Cioci designs romantic, feminine pieces with special attention to novel details and careful craftsmanship. This was Joy Cioci's Mercedes Benz Fashion Week debut. 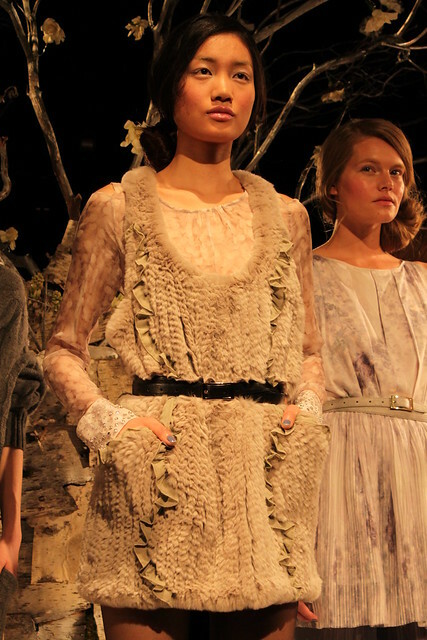 With the models standing around a single brightly tree surrounded by darkness, her Fall/Winter 2011 presentation brought to mind woodland fairies out for a night of mischief. I love the contrast of the rustic, warm, textured tunic with the light, airy blouse. The asymmetrical off shoulder styling of this dress gives it a look that is both feminine and haphazard, as if she's just come back from romping around in the forest. "Plus size" model Marquita Pring. I didn't even realize she was a plus size model until I read about it later!